Spiddal Stick. This variety is alive, which can be recognized by the yellow-colored leaves, and the gas it releases drains your speed. This variety is dead, which can be recognized by the brown-colored and dried leaves, and it doesn't release gas. The ingredient Spiddal Stick comes from the plant "Spiddal Stick," which is a plant native to the planes of Oblivion. There are actually 2 varieties of this plant, both of which yield the same ingredient. When you approach Spiddal Stick plants they release a yellowish cloud which has a Drain Speed effect. 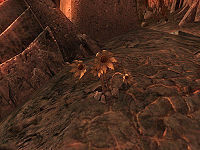 Normally Spiddal Stick plants are not found in Tamriel, however they take root outside of two Oblivion Gates. Even after those gates are closed (and even after the Main Quest is completed) the Spiddal Stick plants remain present and can be harvested. Alchemists may want to ensure that these Oblivion Gates are among those that open, by traveling through these cells at a few stages during the Main Quest. There are no guaranteed samples of Spiddal Stick, but it can be found randomly in the inventories of alchemy vendors. 59 plants are in the Kvatch Oblivion World visited during the Breaking the Siege of Kvatch quest. 41 plants are in Random Oblivion World 7 (which is also the world accessed by the gate that opens outside Anvil). 40 plants are in Random Oblivion World 4 (which is also the world accessed by the gate that opens outside Skingrad). 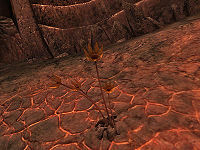 35 plants are in the Bruma Oblivion World visited during the Bruma Gate quest. 28 plants are in Random Oblivion World 2 (which is also the world accessed by the gate that opens outside Chorrol). People who have downloaded the Wizard's Tower official plug-in will also be able to find 10 domesticated plants in the Alchemy Garden - These will not release poison on approaching them. 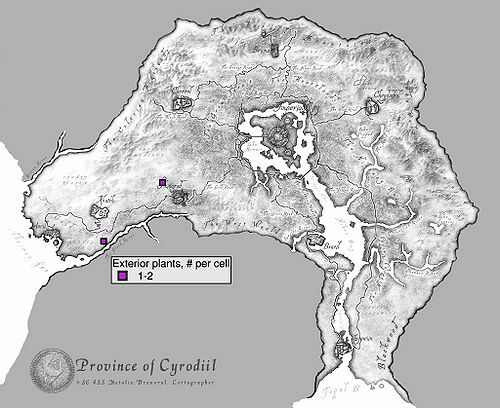 Locations of Spiddal Stick plants in Tamriel. These plants are only present if the associated Oblivion Gate has opened. This page was last modified on 20 September 2017, at 05:25.